Oh, you guys. I don't even know how to start with this one. I have been a fan of the Tiger's Curse series since I read it when it came out in 2011. And this little novella just made my day. Besides the series being a little predictable—in that it fits the typical YA mold with the love triangle and the normal, never noticed girl becoming powerful in her own right, under the attentions of two seriously handsome men vying for her love—it's unique enough to stand out. 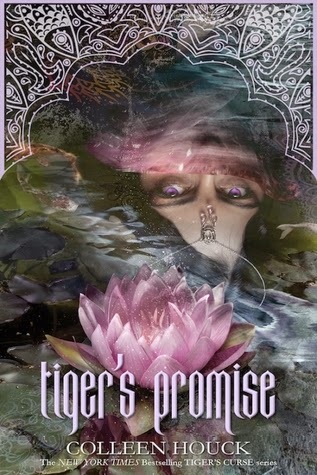 The protagonist, Kelsey, gets swept up on a journey to defeat the evil Lokesh and save her princes-turned-tigers. She leaves Oregon behind and takes on an Indiana Jones meets Twilight meets Harry Potter adventure, where Houck wraps you up in the beauty, tastes, and history of India. Houck's detailed writing (which can be awesome and visual at times and tedious and drawn out at others) and good research pulls the reader straight into the fantastical world she created, and I thoroughly enjoyed the series. But let's talk Tiger's Promise. This little prequel novella takes readers to the beginning of it all. Before there was Kelsey, there was Yesubai. Throughout the Tiger's series we understand that Ren and Kishan (princes and brothers) have very little love for each other. And with good reason. Ren was betrothed to the beautiful Yesubai, but while he was away attending to matters of the kingdom, Kishan went behind his back, wooed her and they fell in love. Ren came back to find his betrothed didn't want him. She wanted his brother. He was betrayed by the woman he had come to love and his own brother. And then? Lokesh makes it so no one can have Yesubai. Ever. That's the story we hear throughout Tiger's Curse. Yesubai was like a ghost who came in and out of the series that kind of made you sad and angry because of what she had done to the brothers relationship. At the same time, I didn't really give her that much thought. Then Houck dropped this little surprise novella on us. (see, we were all waiting on Tiger's Dream, the fifth and last book in the series that has no determined release date.) This little novella comes to us in Yesubai's voice. We learn what Yesubai's life has been like with Lokesh as her father. (and seriously, if you hated him in Tiger's curse, you're going to loathe him in this novella.) We finally learn the real story of what happened between Yesubai and Kishan while Ren was away. Yesubai's story has always been sad, but hearing it come straight from her just kills you. She lived a life mostly shut out from the world, unloved by anyone but her nursemaid, and finally was blackmailed by her father into doing his evil bidding. Part of me wants to recommend that readers read this AFTER they've read the series. I'm not sure it would have been so moving to me if I had read it first. I can't tell. Or maybe you'll read it first and go into the Tiger's Curse series with a little more compassion and be less annoyed at Ren and Kishan (cause they can be really annoying some times with the pride and the fighting, etc. etc) Either way, I highly recommend it. I recommend reading this while drinking your favorite Lassi. I wanted to pair this with a traditional Indian drink, since the story of our tigers is full of tradition and dates back to the BC era.